This Pork Loin Sandwich Starts With Happy Pigs One Rhode Island chef collects all of the ingredients for his sandwich, including the meat, at the local farmer's market. It's piled high with herb-marinaded slaw and greens for a picnic lunch that requires plenty of napkins. 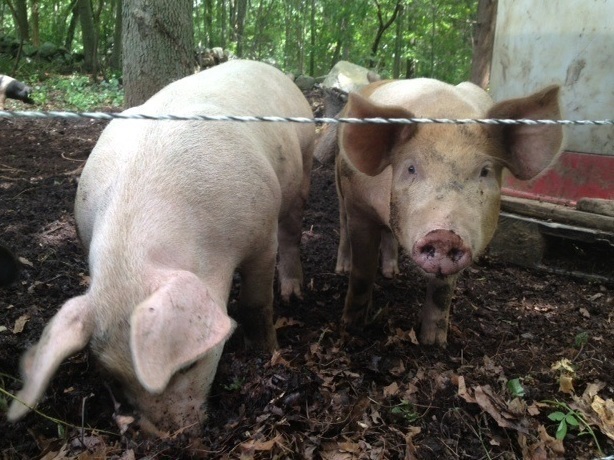 Two pigs root in the dirt at Pat McNiff's Rhode Island farm. It's the time of year when people are flocking to their farmer's market seeking out fresh fruits and vegetables for the summer picnic basket. But what about meat for the sandwich? One Rhode Island chef collects all of his ingredients at the farmer's market, including the meat, to make the perfect pork loin sandwich. Providence chef Matt Jennings' sandwich gets its start down a gravel road, around an old, red barn where a couple of light pink pigs roll in the mud to keep themselves cool in the midday heat. "For me, if I was a pig," farmer Pat McNiff says, "This is where I'd want to be." He's got a point. For six months to a year, these pigs get to laze away on about an acre of this small, Rhode Island farm. A couple of them poke around through the tall grass, others nap under a tree. The more industrious ones root around in the dirt for a snack. "They don't have to pay taxes, they don't have a mortgage to worry about, they don't have to worry about getting fed," McNiff says. "It's a good life." That good life makes great pork. "That's a happy pig," he says. "See the wagging." So how can McNiff send these happy, wagging creatures to the slaughterhouse? "Well, we don't name them," he says. "But also we kind of recognize what they are, what they're going to be in the end. You have to have empathetic detachment, so you have to have this empathy and love for the animal to treat it well to have a great life. But you also have to realize at some point, you're going to say good-bye to it and it's going to become food." Food for customers like Chef Jennings, who, covered in tattoos, looks more like he runs a rock band than a restaurant. Jennings strolls up at the farmer's market to greet McNiff, who is busy selling meat and eggs. Jennings is collecting ingredients for his restaurant's lunch special, a pork loin sandwich. He buys pork loin from McNiff, slides over to the next booth to check out the leafy greens, and then he's off to his restaurant to make a pork loin sandwich. Jennings serves his sandwich on a challah roll with a South American sauce called chimichurri. To make that chimichurri, he chops a few cloves of garlic and loads it into a mortar and pestle along with some ginger beer vinegar, salt, cumin, cilantro, tarragon, mint, and thyme. He adds a squeeze of lemon juice, and mixes it all up into a thick dark green liquid. He mixes the chimichurri in a bowl with long, thin slices of cabbage. "A nicely dressed, acidic, glorified coleslaw that we'll use to top that sandwich and help cut the fat," he explains. After brining and roasting the pork loin, Jennings slices it carefully into thin pieces and stacks it on a roll. He loads the chimichurri slaw and other greens on top of the meat, places the other half of the bun on top, and takes a bite. "You can tell it's a good sandwich when it runs down your arm," he says. "We got a little bit of that happening here. So I would say success." So don't forget to bring napkins on your picnic. This is an easy recipe, and a great way to use up that pork loin from the barbeque the night before, or a bunch of ignored herbs in the crisper drawer of your fridge. If you brine and roast the meat ahead of time, this pork loin and chimichurri slaw sandwich can be made and placed inside your picnic basket in about 20 minutes. 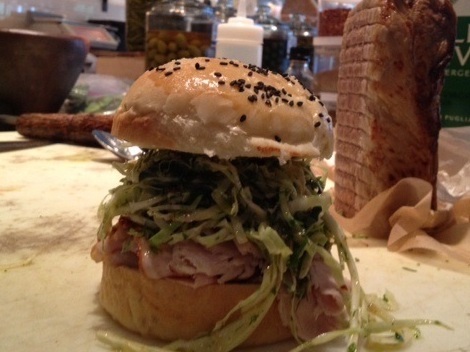 Matt Jennings' pork loin sandwich. You can make the chimichurri the night before if necessary, or even just a couple hours before you serve the sandwich, to make things easier. Place all of the ingredients except the olive oil, salt and pepper into a mortar and pestle. Begin grinding by hand, until the fennel seeds are cracked and the mixture has gone from coarsely chopped consistency to more of a minced consistency. This will take about five or six minutes of hand grinding. Add a dash of kosher salt and a few turns of a pepper mill. Incorporate well into the mixture by hand grinding a few more times. Add the extra-virgin olive oil and mix to combine. Blend all ingredients together in the mortar and pestle and set aside to marinate about an hour or two before serving. Stored in a tightly sealed jar, the chimichurri should be usable for almost two weeks. Shred one-half of a cored head of cabbage with a sharp knife. Make the cabbage ribbons as fine as you can manually, attempting to achieve a chiffonade. Next, combine the shaved cabbage with the chimichurri. Incorporate well. Season to taste. Set aside. Thinly slice some chilled, roasted pork loin or tenderloin, so that you have shaved, stackable meat. On a fresh, soft roll (we use a potato brioche), slather a layer of mayonnaise on the bottom half of the roll. On this bottom half, stack the sliced meat — each sandwich should have about a 1/4 pound, or about eight slices of pork. Next, scoop on a heaping of the chimichurri-marinated cabbage, some spicy greens to top it off — like tat-soi or mustard greens — and serve. Best alongside fresh corn salad and some watermelon shrub to drink. NPR has not tested this recipe.